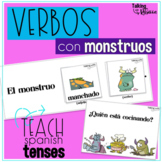 This activity sheet requires students to give the Spanish future tense with given verbs, to change a present tense conjugation to future tense and a future translation section (with verb bank). It can be utilized as a quiz, activity sheet, homework, etc. Future Tense (2). 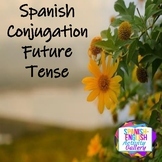 Spanish Verb Conjugation. Verb Wheels. PDF Document. This is a story about a family that will take a trip. 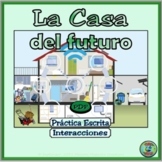 It includes the future tense and also reviews the present/preterite and the imperfect tenses. There are introductory questions and activities included. 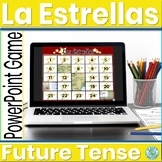 Review the future tense with a card game that ask for predictions on a wide-variety of topics. Especially thought-provoking for honors classes and those on the AP track. Included sixty cards, directions and ideas for other uses of the material. Scissors sold separately. Students will identify the tense of sentences (paste,present, future). Students will write their own sentences in each tense. Teachers: cut each sentence square, laminate and students can sort each sentence in it's appropriate column. LA BATALLA NAVAL. Hit! Miss! Sink! Paired challenge involving making correct choices of adjective agreement while sinking your partner's ships. Exciting paired/partner game that will have students making correct phrases while having fun. En esta versión completa contáis con 36 cartas y la base del tarot donde colocarlas. Tarot para practicar el futuro y/o pasado de una manera entretenida y, además, repasando vocabulario. 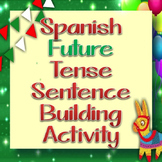 Spanish Future Tense Activity- M.A.C.C.